GRID: Squared mesh 40 x 40 mm. wire: 4 mm. thick. Composed of insulated panel on the lower side (height upon client’s choice between 90 and 160 cm) Tubolar frame 40×40 mm thick wire:2/3 mm thick, square mesh 40×40 mm wire: 4 mm thick. The assembling of the partitioning wall requires a Polyurethane sealant under the “U” channel profile upon which the panel will be fixed. Such system ensures a total insulation between each dog unit. 2) It ensures the maximum safety mostly under the sanitary aspect as the side wall averts contact between dogs and the possibility that a male subject that want to mark its territory would hit its neighbour. 3) During cleaning operations it prevents drains from invading the adjoining kennel maximising the efficiency of cleaning ops. Whole Sandwich Panel: Wall is exclusively composed of Insulated Panel for the whole height of the side walls. 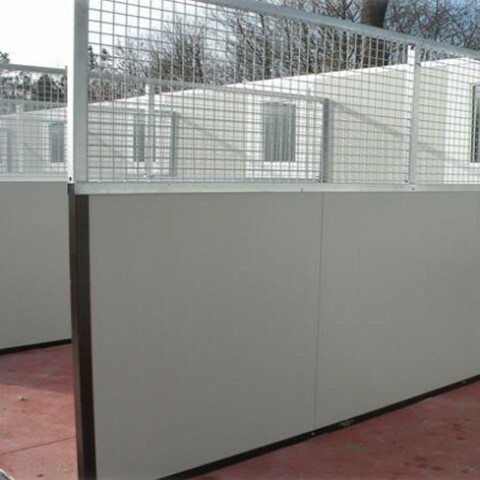 This specific solution is mainly used to build the quarantine units: it’s an insulated Environment, totally shielded from the rest of the structure. 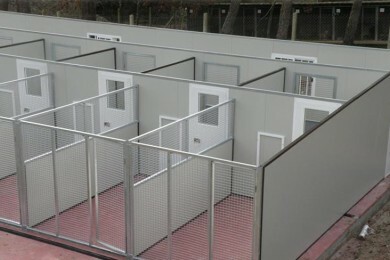 Often this kind of solution is required to obtain the kennel licence.